Cognitive behavioral therapy (CBT) is based on the premise that human psychological problems stem from maladaptive cognitions. One of the most important tools used in CBT is cognitive restructuring that aims to change maladaptive cognitions and replace them with more adaptive ways of information processing. However, maladaptive thinking patterns are sometimes so strong and automatic that they tend to persist and bias the process of acquiring new adaptive ones. The goal of this article is to illustrate the development and implementation of two cognitive techniques for blocking the impact of mental contamination during cognitive restructuring by using fundamental research findings from cognitive psychology. After a brief introduction concerning relevant aspects in the literature, we describe two techniques hypothesized to control mental contamination: (a) the rational anticipation technique and (b) the incompatible information technique. The final section of the article focuses on illustrating the implementation of these techniques based upon a clinical case conceptualization. * Correspondence concerning this article should be addressed to: Aurora Szentagotai, Nr.37 Republicii Street, 400015 Cluj-Napoca, Romania. E-mail: AuraSzentagotai@psychology.ro. Cognitive behavior therapy (CBT) has a well-elaborated theoretical background and documented standard therapeutic process, fulfilling the criteria for a true system of psychotherapy by virtue of the fact that it provides a comprehensive theory of psychopathology and a body of knowledge and empirical evidence to demonstrate its effectiveness. It also retains a certain degree of flexibility in its philosophy and theory, allowing for the accommodation of new modalities. On the treatment implementation level, CBT is continually evolving, with technique-related developments appearing as a consequence of integrating new research results. CBT is considered to be the most heavily researched form of psychotherapy (Simos, 2003), reflecting the scientist-practitioner model, which is generally regarded as being the essence of contemporary CBT (O’Donohue, Halsey, 1997). However, there are those who feel that the current focus in CBT upon details related to various schools and systems of cognitive-behavior therapy does not favor scientific development (see David & McMahon, 2001), and that much of what is still unknown or poorly understood in the clinical domain could be clarified by an infusion of knowledge from cognitive science rather than by various schools debating their status as the promoters of the best view within CBT. 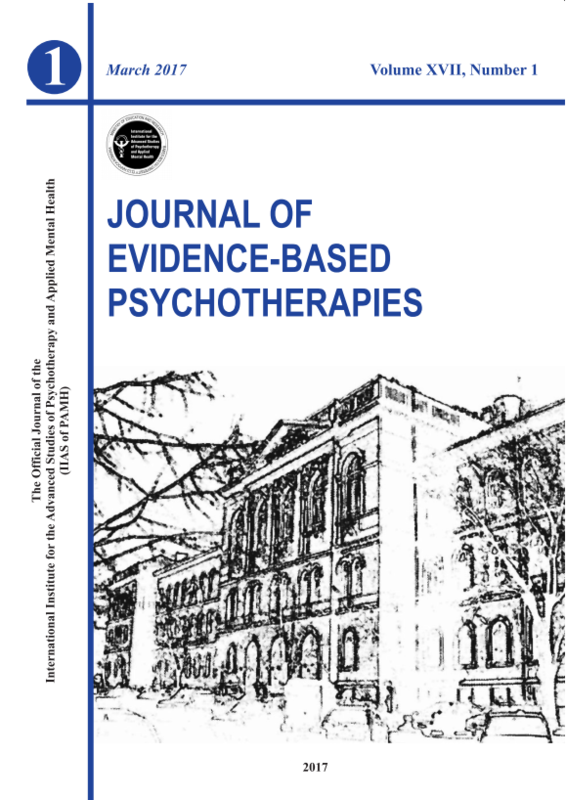 The present article attempts to illustrate the potential of research in cognitive science in leading to the development of valuable therapeutic techniques within CBT. Theoretical aspects related to the topic are discussed extensively elsewhere (David, 2000; David, McMahon, Macavei & Szentagotai in press). Therefore, following a few brief theoretical considerations, the current paper focuses on illustrating the actual applicability of these techniques based upon a clinical case conceptualization. CBT is based on the premise that human psychological problems stem from maladaptive cognitions (Beck, Rush, Shaw & Emery, 1979; Ellis & Greiger, 1977). Therefore, one of the most important tools used in CBT is cognitive restructuring, which aims to change maladaptive cognitions and replace them with more adaptive ways of information processing. According to Beck et al. (1979) cognitive restructuring involves: (1) identifying maladaptive cognitions, (2) modifying maladaptive cognitions, and (3) assimilating adaptive cognitions. Unfortunately, maladaptive thinking patterns are sometimes so strong and automatic prior to therapy that they tend to persist until new thinking habits become stronger and more general through practice. Because of the difficulties people face in overcoming cognitive-emotive and/or cognitive-behavioral discrepancies, they often conclude that the therapeutic process is ineffective, and quit prematurely or decide that practicing new replacement cognitions requires too much effort. The literature suggests that the main strategy for overcoming these two types of cognitive dissonance is to strengthen new adaptive cognitions (Beck et al, 1979; Beck, 1994; Ellis & Grieger, 1977) through: imagery techniques, educational techniques and real-life practice. With the above ideas in mind, we would like to describe the basic assumptions and illustrate the implementation of a complementary category of techniques (David, 2000; David et. al., in press) aiming to teach the patient to reduce the impact of past maladaptive cognitions that block the assimilation of new adaptive ones, and that can be used in conjunction with techniques aimed at the assimilation of new adaptive cognitions. These techniques have been developed based upon research concerning the phenomena of mental contamination (the phenomenon whereby a client experiences an unwanted judgment, emotion or behavior because of mental processing that is unconscious or uncontrollable) (for details see Wilson and Brekke, 1994) and intentional forgetting (IF) (the motivated attempt to limit the future expression of a specific memory content) (for details see Johnson, 1994; Golding & McLeod, 1998). There are several ways of studying intentional forgetting following the same basic principle: subjects are presented with a material for learning (words, images etc), randomly associated with the instruction to forget (F-cued information) or to remember (R-cued information). In the assessment phase subjects are asked to reproduce both F-cued and R-cued information. As mentioned before, there comes a point in psychotherapy when patients recognize that their past beliefs are false and/or maladaptive. This is very similar to the point in the IF paradigm when people are told that the list of stimuli is false and must be forgotten and/or ignored. Patients agree to assimilate new adaptive beliefs. This is similar to the assimilation of the R-cued information in the IF paradigm. Patients can often assimilate a new cognitive pattern but, behaviorally and emotionally, respond according to the old maladaptive pattern. This is similar to the implicit impact of F-cued information in the IF paradigm. Patients are often not aware of the contamination, and even when they are aware of it, the process seems uncontrollable to them. This is similar to the IF tasks, when people are not aware that the F-cued information biases their responses and/or when they are not able to control its impact. The rational anticipation technique (David, 2000; David et al, in press) is an educational technique that aims to teach clients explicitly to anticipate and avoid mental contamination. It is based on the principle that an unconscious influence needs to be made conscious before it can be controlled. It involves the four steps described by Wilson and Brekke (Wilson and Brekke, 1994) as necessary in order to escape contamination: (1) make the client aware of unwanted processing; (2) motivate the client to correct it; (3) make the client aware of the direction and magnitude of the bias; and (4) make the client able to adjust his/her response. The incompatible information technique (David, 2000: David et al, in press) aims to block the activation of unwanted mental processing, thus undermining the first step that leads to contamination. It consists of providing clients with an incompatible alternative to the maladaptive information they hold, while telling them to try to “forget” the maladaptive information. It is assumed that the new incompatible information may block the expression of the old one through lateral inhibition (for further details, see research on the mechanisms involved in intentional forgetting). The applicability of these techniques in clinical practice will be illustrated based upon a clinical case conceptualization. Andrea is a 20 years old woman; she is unmarried, and she is a second year university student; she attends university in a town other than her hometown. Main Complaint. Andrea sought treatment for panic attacks at the end of October 2004. She had had 3 panic attacks during the three weeks prior to beginning treatment, and she was afraid of having them again in the future. She also reported being afraid of being left alone in the house, being afraid to leave the house by herself, and feeling very uncomfortable in crowded places. These symptoms made her feel sad, and not have enough energy and motivation to engage in school and social activities. History of the Present Illness. In 2003, Andrea moved away from her hometown to study at one of the prestigious universities in the country, leaving her parents and boyfriend behind. She mentioned having problems adjusting far from her overprotective parents, and her boyfriend that she had been with for 3 years. She made efforts to go home each weekend to see them. Six months before her first panic attack her boyfriend decided to go to work in Germany. This time apart had a negative impact on their relationship, and they were considering breaking up at the time the symptoms appeared. The first panic attack occurred one evening, in the taxi, as she was going home from a friend’s place, and after having spoken on the phone to her boyfriend who was in Germany at the time. She had drunk several cups of coffee and Cola that day. The other two attacks occurred during the next weeks (2 weeks prior to our meeting). Her symptoms included the following: Emotional symptoms: intense discomfort and fear of loosing control; Cognitive symptoms: she thought that there was something wrong with her heart and that she was going to die; during her second and third panic attack she also thought she was going to go crazy and that she would not be able to stand the situation; Behavioral symptoms: staying in bed that she considered to be a safe place, avoiding leaving the apartment by herself, avoiding taking the buss or being in crowded places; Physiological symptoms: palpitations, sweating, shortness of breath, dizziness. After the first panic attack, Andrea got a complete medical exam, showing that there was nothing wrong with her health. Her GP prescribed her XANAX two weeks before our first meeting. The major sources of stress in Andrea’s life were mainly social ones. Having to leave her overprotective parents and her boyfriend and move to a different town had not ceased to be a significant source of stress even after two years. She found it very difficult to adjust to living in a dorm: not having her own room, and the noise made her very nervous (she moved out of the dorm, into a friend’s house, two weeks after our first session together). Her boyfriend’s decision of leaving for Germany for a longer period of time was another stressor in Andrea’s life. She felt that he was distancing himself from her, and neglecting her. Psychiatric History. After her first panic attack, and before our meeting, Andrea was prescribed XANAX by the GP. She discontinued medication after a week, at the advice of her mother, but then she consulted a psychiatrist who, in addition to the XANAX, gave her antidepressant medication as well. Personal and Social History. Andrea is the oldest child in the family – she has a brother who is 4 years younger. She describes her mother as a strong person, quite controlling, and authoritative, very much involved in the life and future of her daughter. When confronted with situations that require a decision her mother always decides for her. Andrea very seldom contradicts or argues with her, and she always does whatever she tells her to do. Nevertheless, she describes their relationship as a good one. Andrea describes her father as a fairly easygoing and calm person. Andrea’s family has always had a good financial situation and her parents tried to make sure that she had everything she needed. The only thing they expected from her (particularly her mother) was to study and build a good future for herself. Andrea left her hometown, and was separated from her parents for the first time in 2003, when she enrolled at the university. She found it very difficult to be apart from them despite the fact that she had friends, and she got along quite well with her colleagues at the university. She tried to go home every weekend to see her family and her boyfriend that she had been dating for 3 years. Six months before she experienced her first symptoms her boyfriend decided to go to Germany, and they were separated for quite a long time. During this time, her mother started telling her that she should find another boyfriend as her current one was not good enough for her (did not have enough money, was not educated enough etc). At the same time he started distancing himself from Andrea, and told her that he needed time to consider their relationship. Her first panic attack occurred 3 weeks before our meeting, after a conversation on the phone with her boyfriend who was in Germany at the time. She consulted her GP that prescribed her XANAX, but she discontinued the treatment at her mother’s advice. At the time we’ve met she had already seen a psychiatrist as well (who gave her XANAX as well as antidepressant medication), and she had experienced three panic attacks. Medical History. Andrea had no medical problems. She requested a complete physical exam after her first panic attack, which showed that she was in very good health. A. Precipitants. The panic disorder may have been precipitated by her boyfriend leaving for Germany, and by the challenges they were going through, that made her feel abandoned and neglected. Her mothers’ pressures to leave him because he was not good enough for her could have precipitated her panic attack as well. Finally she experienced difficulties having to live in a dorm, and not having a room of her own, that made her feel stressed and nervous almost all the time. B. Cross-Sectional of Current Cognitions and Behaviors. A typical illustration of Andrea’s problems was her first panic attack. It took place one evening, after a phone conversation with her boyfriend. She had drunk several cups of coffee, and a large amount of Cola that day. She was in a taxi, and she had the following thoughts “He does not love me anymore. He neglects me, and he will probably abandon me. I will be completely lost without him”. Emotionally she started feeling anxious and agitated. She had to ask the driver to stop because she was experiencing shortness of breath, palpitations, sweating and dizziness. Another automatic thought came to her mind: “There is something wrong with my heart; I will probably have a heart attack”. The discomfort was so intense that she had to get out of the car for a while. Another situation illustrating Andrea’s problem is her second panic attack. She was going to school after another phone conversation with her boyfriend. She started thinking about being abandoned and not being able to cope without him. She started experiencing the same physical symptoms and immediately she thought: “I will lose control in the middle of this crowd. They told me there was nothing wrong with my heart, so that means I am going crazy. I will go crazy here!” The fear of losing control and going crazy was so strong that she had to sit down on a bench and call a friend to pick her up and take her home. Thereafter she refused to go out of the house unattended. Andrea’s third panic attack occurred after her visit to the psychiatrist’s office. As she was going home, she started thinking “I saw all those sick people there. I will end up like them. I will go crazy. I can’t stand this anymore” She experienced her third panic attack, and this time her fear was mostly related to losing control and going crazy. C. Longitudinal View of Cognitions and Behaviors. Andrea grew up in an overprotective family that made sure she always had everything she needed. Her mother insisted on making important decision for her, telling her that she knew what was best for her daughter. The only thing her parents asked of her was to study and make sure she’d build a good future for herself. The following irrational thinking patterns developed as a result of these experiences: “People who are important to me must take care of me, organize things for me, and help me make decisions”; “People who are important to me should always be there for me. It is awful and I can’t stand them neglecting me; it makes me feel unlovable, and unable to cope!” These thinking patterns are also reflected in the way she sees her current problem. D. Strengths and assets. Andrea is an intelligent person, in good physical health. She is highly motivated to do something to recover, and be “like I used to be before”. E. Working Hypothesis. As a result of her (dependent) personality traits, and of her above-mentioned irrational thinking patterns (e.g. the others must be there for me; the others must take care of me; it is awful when people I love neglect me), Andrea experienced the separation from her family as a difficulty that she could not get over even after 2 years. She often felt abandoned and neglected; she would not tell them though, as she did not want them to be disappointed, as her studies were very important to them. Her boyfriend’s decision of leaving for Germany for a long period of time, as well as the fact that he was distancing himself from her, further activated and maintained the beliefs that being abandoned and neglected was awful, and that she would not be able to stand the situation, probably leading to Andrea experiencing her panic attacks. A. List of problems (1) Andrea’s panic attacks; (2) Andrea’s refusal to leave the house by herself, and go to crowded places (agoraphobia); (3) Andrea’s difficulties in making her own decisions; (4) Relationship with boyfriend concerning the decision of staying or not staying together and coping with the consequences. B. Treatment Goals (1) Reduce panic attacks; (2) Reduce agoraphobia; (3) Build problem solving, and decision-making abilities; (4) Implement problem solving and decision-making skills in her relationship with her boyfriend. C. Treatment Plan The treatment was planned to reduce Andrea’s panic attacks and agoraphobia, to increase her problem solving and decision-making skills. We approached panic attacks using a treatment package containing: cognitive restructuring (to reduce catastrophic interpretations) and hyperventilation/controlled breathing techniques to explain and control panic attacks. Cognitive restructuring and a distraction technique were used to reduce agoraphobia. In order to enhance Andrea’s problem solving and decision-making skills, we used problem solving training and decision-making training. 1. The patient was taught a distraction technique that she was encouraged to use to control panic attacks. The goal of using this technique was (1) teaching Andrea that panic attacks could be controlled, (2) offering her a technique that would help her manage her symptoms in the initial phase of the treatment. 2. The patient was introduced to and illustrated the cognitive model of anxiety. She was also introduced to hyperventilation with the goal of modifying catastrophic interpretations that appeared during panic attacks. Paced breathing was practiced as a means of managing hyperventilation. 3. Cognitive restructuring and behavioral techniques were used in order to manage maladaptive thinking patterns. Both cold (non-evaluative) and hot (evaluative) cognitions (Abelson, 1958) were addressed through several techniques some of which will be illustrated as follows. Understanding the connection between cognitions and emotions was an important step in therapy that significantly reduced Andrea’s anxiety levels. 4. Problem solving and decision-making skills were introduced and practiced with the goal of improving the patient’s interpersonal relationships and decision-making abilities, and helping her become less dependent. D. Obstacles Andrea’s dependent personality traits made her very vulnerable to the other’s opinion concerning psychotherapy. She nearly discontinued twice as a result of her mother telling her that she did not need a psychologist, and that seeing a psychologist meant that she was crazy. We worked on breaking her myths concerning therapy and people needing therapy. F. Treatment outcome Andrea’s therapy extended over 15 sessions. One month after terminating treatment Andrea had no recurrence of panic attacks and no agoraphobia symptoms. However, she had symptoms of anxiety when she was at home by herself; these symptoms did not meet DSM IV criteria for anxiety disorders. Her decision-making and problem solving skills improved significantly, with a beneficial effect on her relationships with her parents and boyfriend. Her dependant personality patterns became less visible in her interpersonal relationships. As mentioned before, cognitive restructuring aims to change maladaptive cognitions and to replace them with more adaptive ways of information processing. The goal is for the client to experience more personally and socially adaptive changes in affect or behavior. The rational anticipation technique and incompatible information technique aim to teach the client to reduce the impact of past maladaptive cognitions that block the assimilation of new adaptive ones. It is assumed that, used in conjunction with techniques directed towards the assimilation of new adaptive cognitions, they will facilitate the process of cognitive restructuring (David, 2000; David et al, in press). Bellow we reproduce excerpts of the clinical protocol used in the case of Andrea, illustrating a possible clinical implementation of these techniques. The excerpt presented here illustrates the use of the technique in challenging Andrea’s belief that she would lose control and have another panic attack when she was alone in the house. This thought generated high levels of anxiety, and made her stay in bed motionless until someone came home. T (therapist): Now tell me how convinced are you of the fact that you’d lose control and have another panic attack when you’re by yourself. P: (patient): Well, after our discussion I am not so sure anymore that this would happen. T: Do you remember how much you believed in this thought when we first started talking about it, on a scale from 0-100? P: Very much, about 95 if I remember correctly. T: Yes, about 95; and now –how convinced are you of it? T: Ok, let me ask you something: who will be at home when you get there after this session? P: My roommate will be there. T: Let’s try to imagine something. Please try to imagine that you get home and you discover that there is no one there, that the room is dark, and you find a note from your roommate saying that she will only be back late at night. T: Try to imagine this as vividly as you can, and then tell me what you would do. P: Well, if it happened tonight I would probably go right to bed. P: I would be afraid of having another panic attack. T: But you’ve just said you don’t believe that anymore. P: Well, I don’t! I mean I do but very little after going over all those things with you. T: But you still think you would act according to your old belief. P: Yes, and I don’t quite know why. T: Let me tell you what I think is the case. Even though you’re consciously telling yourself that you will not have another panic attack, your old belief – I will lose control and have an attack – still influences you on the unconscious level. What we can do is to identify the moment when this thought appears and replace it with what we consciously know to be true. P: Ok. Do you think that’s possible? P: I would not move from bed for fear of having another attack. I would probably stay there till someone came home even if I were hungry. P: I would have not even realized that. I used to like being by myself. I would have probably eaten something, taken a shower, watched TV or gone over my notes from classes that day. T: A few minutes ago you’ve told me that you believe you will be ok, that you will not lose control and have a panic attack (Goal: Motivate to control contamination). T: Then let’s talk about what you can do this week when you’re by yourself. (Goal: practice skills to adjust the reponse). The excerpt presented here illustrates the use of the technique in challenging Andrea’s belief that she had failed as a daughter and disappointed her parents because of the problems she was facing. T: So you felt guilty after talking to your mom on the phone. P: Yes, very! She made me feel very guilty! T: No, your mother did not make you feel guilty. Think about what we’ve said about the triggers of emotions such as guilt. What was it that made you feel guilty? P: Well, the fact that I thought I was a failure as a child because I had disappointed them. T: That’s right, your thoughts made you feel guilty. Do you still believe that now, that you are a failure as a daughter? P: I guess I still do. T: Let’s take the word failure, what does it mean? P: When I think of someone as a failure I mean that they are bad at everything they do, right? T: Right, so what you’re telling me is that you are bad at everything you do and that there is no reason on earth your mom and dad should be proud of you. P: No, that’s not what I am saying. I think they are proud of me for many reasons. T: Can you tell me some? P: The fact that I do so well in school, the fact that I got that scholarship I was telling you about, that I have published a couple of articles in the university newspaper, that I try to help them as much as I can, that generally I am a warm and pleasant person. T: And there are other things I am sure; so can you still say you’re a failure and a disappointment to them? P: No I guess not. No! I might have exaggerated a little. T: Yes, I think you have! There are many things pointing to the fact that you are not a failure. Actually I would rephrase this the following way – there are many things pointing to the fact that in several important areas of life you are quite a success, right? P: Yes, now that you put it this way…. The present article has attempted to exemplify the clinical implementation of two techniques that aim to teach the client to reduce the impact of past maladaptive cognitions that block the assimilation of new adaptive ones. These techniques were developed based upon a re-conceptualization of cognitive-emotional and cognitive-behavioral dissonance met in CBT practice in terms of mental contamination, and have proved to be effective in therapeutic context (David, 2000; David et. al., in press). We believe that a re-conceptualization of some clinical phenomena, following new developments in cognitive science, could have heuristic value as it could improve the efficacy of psychological intervention that, in turn, could validate the model of the human cognitive system. Abelson, R. P., & Rosenberg, M. J. (1958). Symbolic psycho-logic: A model of attitudinal cognition. Behavioral Science, 3, 1-13. Beck, A. T., Rush, A. J., Shaw, B. F., & Emery, G. (1979). Cognitive therapy for depression. The Guilford Press, New York. Beck, J. (1994). Cognitive therapy. Basics and beyond. The Guilford Press, New York. David, D. (2000). Unconscious information processing (Prelucrari Inconstiente de Informatie). Dacia Press, Cluj-Napoca, Romania. Ellis, A., & Grieger, R. M. (1977). Handbook of rational-emotive therapy. Springer Publishing Co, New York. Johnson, H. M. (1994). Processes of Successful Intentional Forgetting. Psychological Bulletin, 2, 274-292.